OK, this is not a beautiful transformation, but it sure works great. Take the drum out of an old machine and use it as a fire-pit. I don’t think they are so aesthetically pleasing “as-is” for a backyard, but let me tell you, these wash tub fire pits are perfect for beach bonfires and camping trips. It elevates the fire enough so that when the smoke blows (always where I’m sitting, dang it) it blows over your head instead of in your face. It keeps the wood and kindling nicely contained. When camping, we use it as sort of a trash can during the day for paper products (paper plates & napkins, etc) and then they serve as a great starter to get the wood burning. The holes in the sides allow for a great airflow, so your fire starts quickly and burns brightly. We have also found that it is easy to clean and store. With High Efficiency washers and dryers becoming more and more popular, the older top loading washers are all over the place. Once you find your washing machine, take the drum out. I can’t necessarily give you a step by step on how to do this because different makes and models will have the agitator attached differently. The agitator might just lift straight out, but most likely you will need to remove the fabric softener dispenser if there is one. Then remove the cap on the agitator. There might be a bolt holding the agitator in place, and you’ll need to do away with that. Any trouble, just google “wash tub fire pit” and I am sure you will find a tutorial on the make and model you are cannibalizing. If you can’t find a wash tub, there are also good tutorials on how to build a fire pit without one. It’s cheap, it’s relatively easy, and it is actually quite pretty at night. Now who’s ready for some s’mores? I love it V! That’s thinking out of the box! Have fun with it! Seriously, Viv…you are the most creative person I know…this is amazing! What a fantastic idea! How do you do it???? around the yard were needed. Do you have a picture of your firepit connected to a wheel drum,etc? I am trying to figure out a way to keep the drum off the ground since I am renting where i live. Also, do you try to roast hot dogs or marshmellows on your wash machine fire pit??? it looks like it might be kind of ‘alot of fire and no coals’ since the sides are high. Hi Marion, sorry, but I don’t have a photo that shows it connected. You can elevate the drum by stacking it on cinder blocks or bricks to keep it off the ground. We don’t roast the marshmallows or dogs over the coals, but the heat from the flames does just fine. That is a very clever recycle/reuse idea! You are so creative! Nice! Very clever…thanks for the share! Very clever! Love the look of it at night! great idea and it looks cool as well! That rocks! Did you use it camping? Cool! Or hot? Whatever. Pass me a marshmellow. Great Idea, Viv. I’ll even have an extra washing machine that I can use when we move. We have a campground area in the back of our yard and this would be perfect there. Very ingenious – looks pretty cool, too. I think this is pretty darn awesome! Where do you come up with these things?? It does look spectacular at night! So resourceful! Would be a great idea to convince hubby to get a new washer : ) Thanks for linking up this week! This is great. I’ve been using a plain metal tub–as in really old-fashioned wash tub that is wearing out. This would make an interesting replacement. Wow! This is super smart, Vivienne! I actually love the look of it with the being able to see the fire through the small holes. It also looks very reliable! Thank you so much for linking up! Love your clever recycling project! Ok, Viv, that is just cool. I would never have thought of that! Wow? Seriously?? What a great idea. You really can recycle everything!! What a neat idea! And it is pretty at night. So smart! Of course we just sent our washing machine to recycling about one month ago! Wish I could get it back! Thanks again for linking up to the Creative Spark! Viv, this is so darn cool! This deserves not only a Stumble, but a Pin and FB feature too! Oh my goodness! That is the best idea ever! We would love for you to share this at our link party and come enter our free digital scrapbooking software giveaway! Love the look of this! Thanks for linking to the Tuesday To Do Party! It is good that, if we reuse our wastage things to some important and useful things. 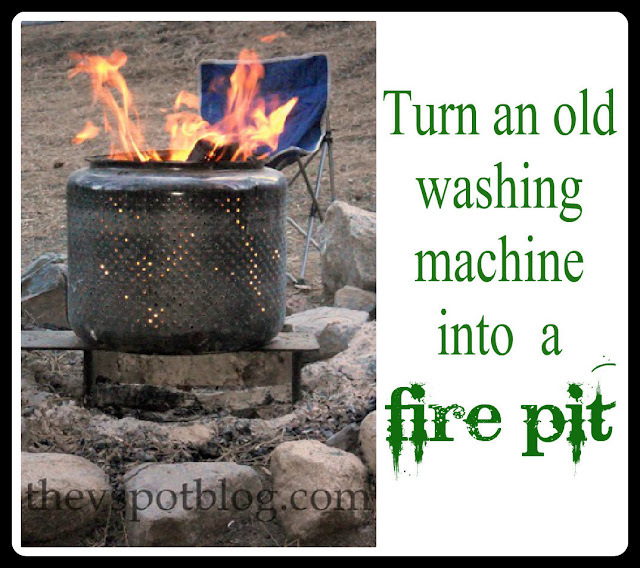 Not only old washing machine but also we can use more other old and waste items as fire pits. This post is beautiful transformation and shows great information. These do make idea firepits, however I CAUTION you… I salvaged a washer drum from a reasonably new washer, and used it as a firepit.. However, the very first time I used it. I was fortunate enough to be well away from it when there was a significant explosion. With some investigation, I discovered the debris from the explosion was tiny metallic BB’s.. several pounds of them strewn around the yard. These BB’s are sealed in the rim of the washer drum (I found out later) to help balance the drum when spinning. This sealed area on the drum, has a welded plug used during manufacturing to pour in the BB’s. When the drum heated up for the first time, the pressure built in the sealed are to the point that the filling plug failed and the BB’s exploded out of this hole. They covered a 25 foot diameter around the drum, and flew 20 feet in the air.. certainly enough to do significant injury if in the area. Need this! Thanks for the brilliant upcyled idea – now off to troll Craig’s List! While it’s a good idea, it’s definately nothing new. Everyone around here has this. Darryl is right. Be careful the first time you use it. Remove plastic around the rim. Nancy, I am not sure why, but your comment struck me as a little snippy and dismissive. While I’m sure that “everyone around here has this” where you are, please read the 40 comments before you and check the 2,000+ pins it has on Pinterest… it appears that not everyone knows about this possible transformation. I did not claim that I invented this… just sharing information with people who are NOT your neighbors about something they might not have known about. Great idea that you shared the drum pit into fire pit..thanks for the sharing. We have been doing this for a long time using a drum from a dryer. The last new one we used, burned all around the outside, as it had a porcelain painted finish. Just a warning, be careful the first few times you use it. So easy to use. Would it be possible to make a stove, withour removing the top off it? As i have pretty limited tools was thinking how to make a quick stove for cooking, and the top of the drum is quite flat already so i could fit a few pans on it..?